Not every man between the ages of 20 and 45 made a good soldier. Some for religious reasons or for family reasons opted out of the draft by paying men $300 to fight for them. Unfortunately many of the subs were in the business of collecting the money and went AWOL only to reappear under another names with another man's $300. In 1863 the government passed the Enrollment Act also known as the Civil War Military Draft Act provided for those men between the ages of 20 and 45 who did not want to fight to continue to pay someone to fight for them OR to pay $300 and be relieved of duty. This new law would help raise funds for the army as well as stop those men from taking the money but not following through. In September 1863 a revised law was passed to refund the $300 if the person should not have paid. Here is a transcription of the law from the New York Times. Genoa Township, Delaware County, Ohio resident, John Wherry was drafted from the Eighth Congressional District of the State of Ohio into the service of the United States during in the Civil War. 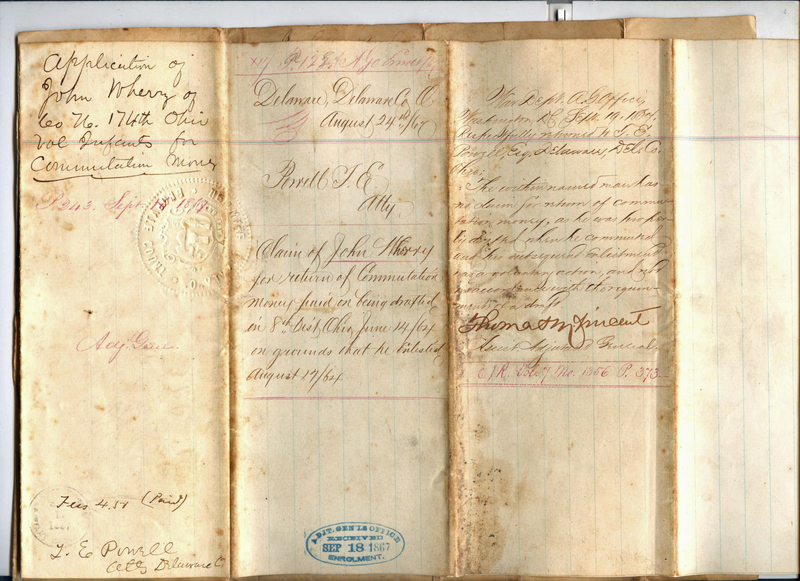 Under Section 13 of the Act for Enrolling and Calling out the National Forces, Wherry paid $300 to I. Ranny in Delaware, Ohio on June 23rd, 1864 to obtain a discharge from further liability under the draft. At the time John was the father of a 6 year old girl and a year old son. 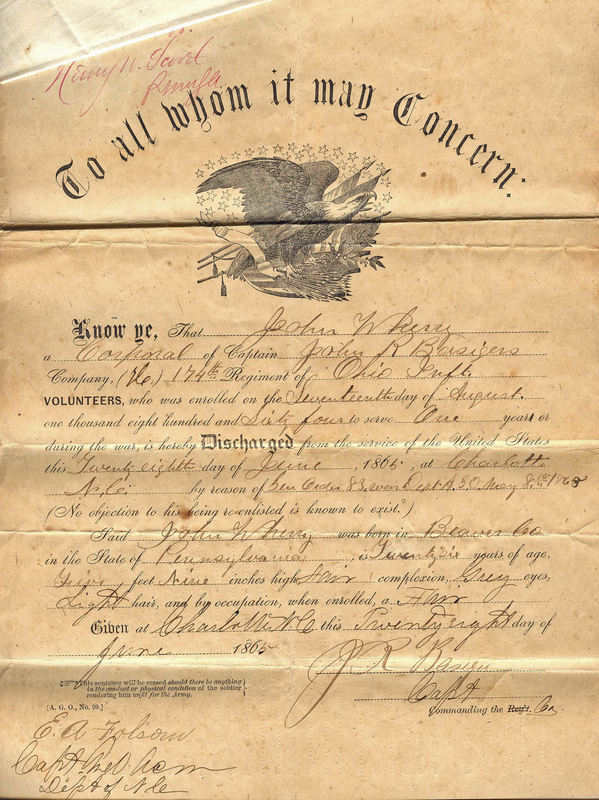 For some reason, John enlisted for one year August 13, 1864. He may not have known his wife was pregnant with their third child. According to Wikipedia the 174th left Ohio for Nashville, Tenn., September 23, arriving there September 26. Moved to Murfreesboro, Tenn., and duty in the defenses of that city until October 27. Moved from Murfreesboro to Decatur, Ala., October 27. Defense of Decatur October 27-29. Moved to Elk River October 29 (four companies detached at Athens, Alabama). Returned to Decatur November 1 and duty there until November 25. Moved to Murfreesboro November 25. Action at Overall's Creek December 4. Siege of Murfreesboro December 5-12. Wilkinson's Pike, near Murfreesboro, December 7. Ordered to Clifton, Tenn., and duty there until January 17, 1865. Movement to Washington, D.C., January 17-29, and duty there until February 21. Moved to Fort Fisher, N.C., February 21-23, to Morehead City February 24, and to New Berne February 25. Advance on Kingston and Goldsboro March 6-21. Battle of Wise's Forks March 8-10. Occupation of Kinston March 14, and of Goldsboro March 21. Advance on Raleigh April 10-14. Occupation of Raleigh April 14. Bennett's House April 26. Surrender of Johnston and his army. Duty at Raleigh and Charlotte, N.C., until June. The regiment lost a total of 117 men during service; 1 officer and 21 enlisted men killed or mortally wounded, 1 officer and 94 enlisted men due to disease. John Wherry served his unit well and was made a Corporal along the way. He was mustered out with the rest of the 174th on June 28, 1865 in Charlotte, N.C. In August, John Wherry filed before Delaware County Probate Judge T. W. Powell an Application for return of his $300 Commutation Money. 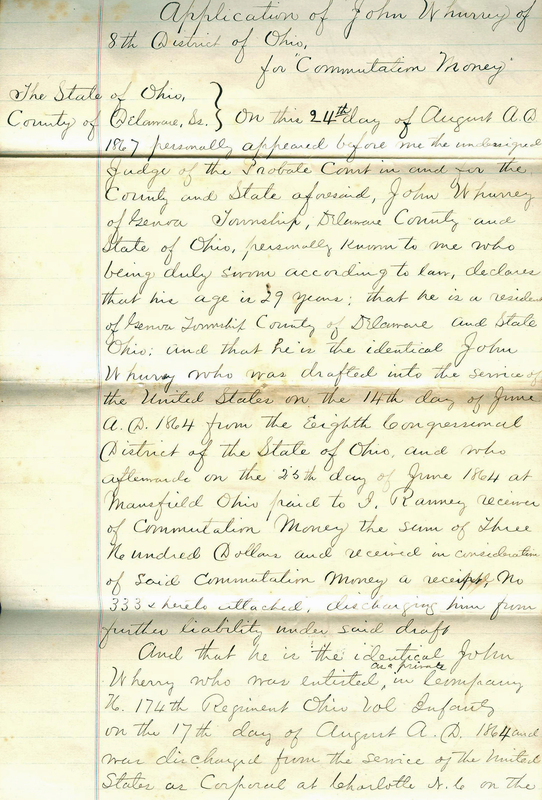 In his application he claims he was drafted on June 14th 1864, paid the $300 Commutation money to I. Ranney in Mansfield, Ohio. Then in August 1864, he enlisted in Company H. His application is witnessed by William S. Steel and George W. Wills. The following certificate of this service is signed by Capt. John R. Basinger. Reverse of the above document is below. 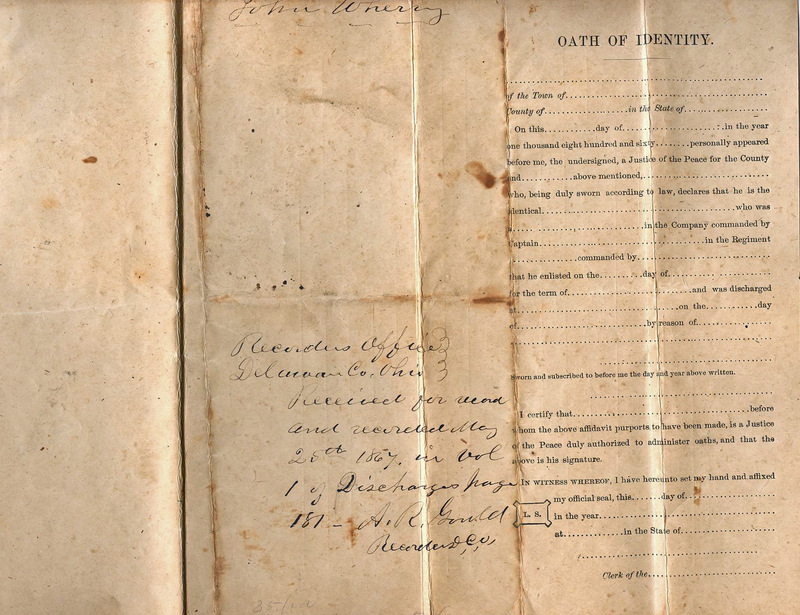 The application and accompanying documents were received Sep. 18, 1867 in the Adjt. General's Office in Washington, D.C. The reply was sent to T. E. Powell, Esq. of Delaware in Delaware County, Ohio. The within named man has no claim for return of commutation money, as he was properly drafted when he commuted and his subsequent enlistment was a voluntary action, and not in accordance with the requirement of a draft. John Wherry was born in Beaver County, Pennsylvania May 6, 1837. According to the Delaware County Cemetery Records, his father was Samuel Wherry. In 1850 there was a blacksmith in Ohioville, Beaver County, PA. named Samuel Wherry born 1809. His wife Sarah was born about 1809. There children were Samuel D., John born about 1836, Mary, Joseph and Elizabeth. Perhaps these were his parents. John married Margaret Steel on March 21, 1861 before G. W. Wells, J.P. in Delaware County, Ohio. In the 1870 Federal Census, farmer John(32) and his wife Margaret Ann Steel Wherry (30) were living in Genoa Township with her father William S. (65) and Sarah (64) Steel and their daughter Eliza Steel (18). John and Margaret had three children Eva (8), George Grant (born 9-1863) age 6 and William Sherman (born March 1865) age 5. In the 1880 Federal Census for Genoa Township, William Steel is listed as head of the household and a farmer. His wife Sarah died in 1878 but his daughter Eliza Steel lives with him. .His son-in-law John Wherry is the Assistant Farmer. John and Margaret added son Nathaniel (born 1877) to the family. Also in the census is Sarah Wherry (73) who is probably John's mother. John and Margaret's son George G. (17) has a wounded foot. William S. Steel born in April 1805 died in May 1898. In the 1900 Genoa Township census, John and Margaret are still on the farm. Margaret's sister Eliza is with them as well as their grandchildren Warren Ross Price (18) and Ada E. Price (11) who were the children of Warren and Eva Wherry Price. Nearby John's son William Sherman Wherry had his own farm, He married Ella M. Shaw. Their son Clarence was born in 1895 and died in 1906. Their daughter Ora L. was born about 1898. William died in 1941 and Ella in 1944. Both are buried in the Africa (East Orange) Cemetery. Clarence is also buried there. John's son George Grant Wherry married Elenora W. Fuller or Fultz who was born December 1865 in Indiana. They had John Benjamin Wherry born 8-17-1890 and Albert born January 1897, both born in Ohio. In the 1900 Census the family lived in Montrose, Colorado. In 1910 the family was living in South Payette, Canyon County, Idaho. George died in 1943 in Payette, Idaho. Nathanniel Wherry born October 15, 1877 in Galena, Ohio, married Bertha Williams. In June 1908 they moved to Victoria, British Columbia, Canada where Nathanniel was a taxidermist. On March 14, 1916 Nathanniel registered as an American in Canada. He listed George G Wherry of Payette be notified in case of death or accident. Bertha and Nathanniel had a son Lawrence Allen born February 13, 1913 in Vistoria. John and Margaret Wherry are buried in the Africa (East Orange) Cemetery on Old State Road.